Borderlinx | Buy Vans and ship worldwide with Borderlinx. Cheap rates guaranteed. Footwear can be about more than just shoes. It can be about art, expression, and individuality. Footwear can reflect a culture, a scene, or a world view. Vans USA celebrates the full potential of what you wear, offering a bold reinterpretation and exploration of footwear. For over 40 years, Vans USA has been supplying unique, artistic footwear to men, women, and kids, perfect for skaters, beach-goers, and just about anyone else. Vans USA Clothing lines include a wide selection of apparel offering the same bold creativity as its footwear. Find expression through what you wear with Vans USA. Vans USA products are sized for just about anyone, from men and women to kids of all ages. Shopping from Vans USA offers customers an excellent experience, from expansive customer service to quality and affordability. Most items are available for under $100, including specialty sportswear such as boardshorts or accessories like backpacks and phone cases. Vans USA fit guides help you find your perfect style, whether it's skate, surf, classic, or more. If no style calls your name, Vans USA also offers custom shoes, where the style, color, design, and even shoelaces, are all up to you. 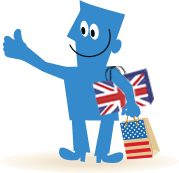 With Borderlinx, international customers can now buy Vans in the USA with cheap shipping, tax & duties! Using our shipping cost calculator, Borderlinx will ship your order right to your home country. Additionally, a number of services are available through Borderlinx to make international ordering from Vans USA hassle-free, including concierge, free repacking and consolidation services.